Simple, delicious and surprisingly little mess to clean up! We had our friend Katie over for her birthday dinner last night. It was quite an honour that she chose to spend it with us. So we figured we should pull out a stop or two and give her a memorable meal worthy of someone who is such a good friend. People like her are the gardeners of our hearts. What we chose to make was simple: steak and fries... coffee-chilli rubbed steaks and crispy baked sweet potato fries. This is the spice rub. Keep this one for summer, for sure. Coffee, chilli pepper and cocoa are a match made in heaven. 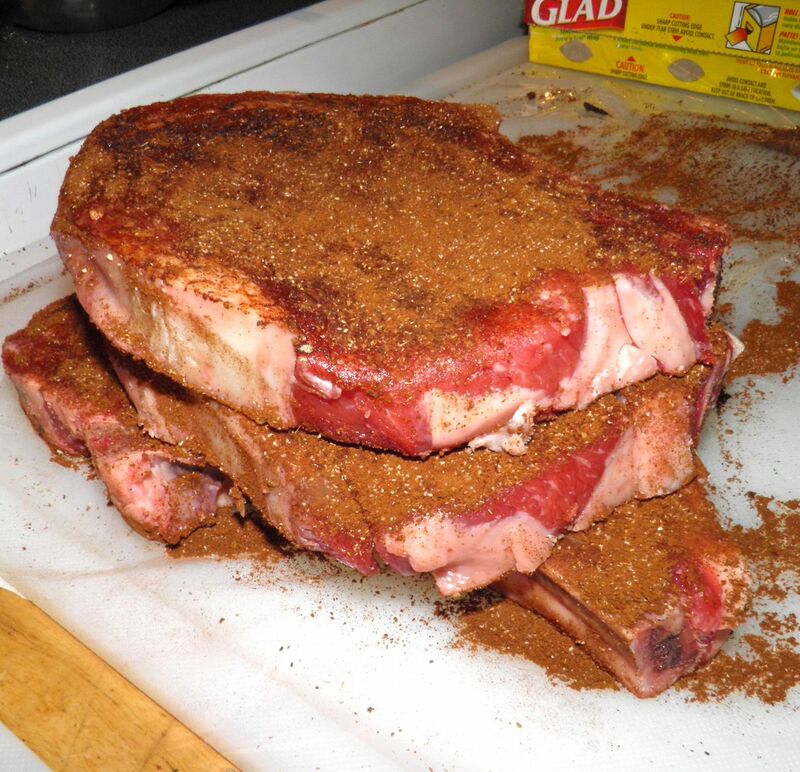 Add to that some cumin and you’ve got one of the best steak rubs you will ever have. I’m not sure if it was something in the rub or the steaks themselves but they seemed to be tenderized, turning out moist and delicious. We used rib-eyes because they were on sale. They're better to start with than many cuts. The coffee didn’t leave a strong coffee taste. It added more of a deep, rich taste than anything else. The main flavour to me was cumin. 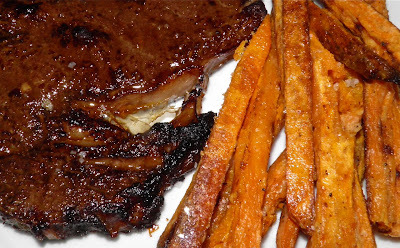 The rub complemented the sweet potato perfectly. Now I have to say a word or two about sweet potato fries. They have every possibility of being a “Pinterest Fail” if you follow half of the recipes out there. Google “Pinterest Fail” if you don’t know what I mean. You’ll have a laugh. I read several recipes before attempting them. Most say to bake for 30 minutes or less. Unless you have cut shoestring fries they will never – I say NEVER – crisp up in that time. Anyone who thinks they will are on drugs. There’s also another inherent risk to making them. They stick—badly—unless allowed to cook until crispy. Any time shorter and you have soggy fries that break apart. I know this is fact. Several of my fries did just that. The length of time “recommended” (30 minutes) is pure fiction. Luckily I had the time to let them cook until crisp, which took another 15 minutes. Then I was able to broil the steaks. The end result was extremely good though, after the additional time. Since the rub was for four steaks, but I only made three, I sprinkled some of the remainder on top of the fries for seasoning. 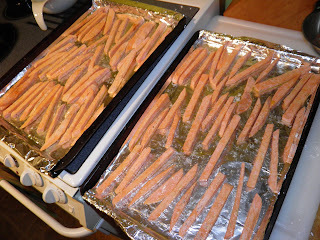 If anyone else has had problems or success baking sweet potato fries leave a comment. I would love to work out a foolproof recipe! This may have only been steak and fries, but what steak and fries. These recipes have no complicated preparation. Definitely recipes to repeat. Maybe with a salad in summer. 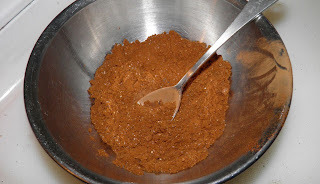 This rub will certainly make it onto the barbecue come June or July. If you’re in a southern hemisphere or tropical country you won’t have to wait. Alas, here in Nova Scotia we’ll have to until the snow melts. We had a wonderful dinner with a wonderful guest. We can’t wait to do it again with her, although it almost certainly won’t be until after we move the first week of March. Maybe the weather will be warm and we can eat on the back deck! counter, or longer in the refrigerator. 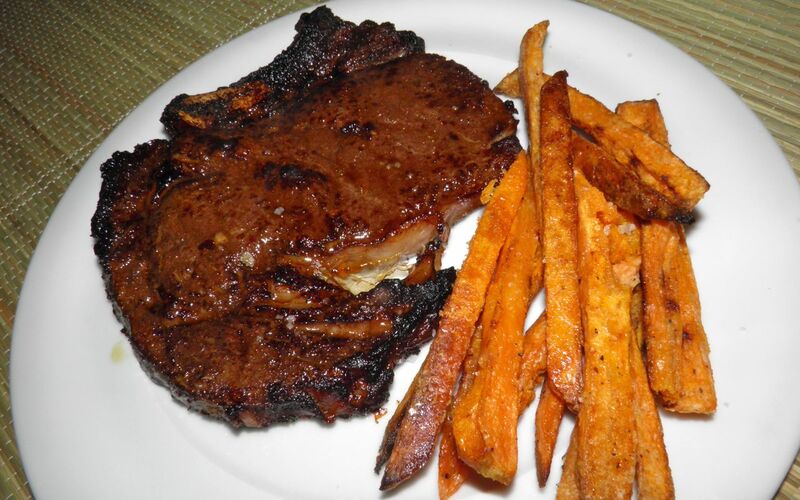 Combine all the ingredients except for the steak in a spice grinder. Pulse until well ground. Rub the seasoning into the surface of the steaks on both sides. Let them rest on the counter for one hour, or for 8 hours in the refrigerator. So you can do this before work and be ready when you come home. Broil or grill the steaks until cooked to your desired level of doneness. Let rest for a few minutes before serving, to redistribute the juices. This is only three regular sized sweet potatoes. Peel the sweet potatoes and cut into fries of equal size. The more even the fries the more even they will cook. Soak the cut fries in water for 30 minutes. Pat dry with paper towels. Preheat the oven to 450°F. Place the fries in a plastic bag. Mix the cornstarch, salt and peppers. Pour over the fries and toss well. Make sure the cornstarch is well distributed. Prepare two baking trays by lining each with foil (for easy cleanup) and rubbing a tablespoon of oil over the surface of the foil. Arrange half of the fries on each tray. Bake for 30 minutes, then turn the fries and bake for another 15 minutes. Some of the fries will be browned on the edges. Sprinkle with a little more salt if desired before serving. The cornstarch helps dry out the surface of the fries so they can crisp up.